A woman in the U.K. was none too pleased when the game of Countdown she was playing with her three-year-old son threw an anagram at them that unscrambled into "sh*theads." 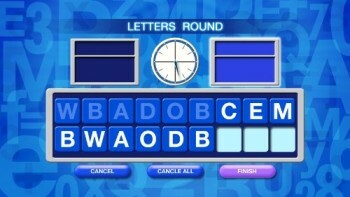 Countdown is a long-running game show in the U.K. in which players attempt to create words out of randomly chosen letters, solve math puzzles and, in the final round, unscramble a nine-letter anagram. In 2009, Mindscape and Koch Media released a home version of the game for the Nintendo Wii, which is what Victoria Smith and her young son Oliver were playing when it asked them to unscramble the letters "SHAHSITED." The solution was revealed to be "shitheads," an amusing answer if you happen to be playing a Countdown drinking game with your buddies but not so much when you're partnered with your preschooler child. "I couldn't believe my eyes as the word was slowly unveiled as an obscene insult," Smith said. "Oliver is a really bright kid and we play this game to help him build up his word bank." "He was already asking what the word meant," she added. "My husband Daniel had to usher him out of the room." I was a little curious, so I plugged the letters into a couple of anagram solvers on the internet and sure enough, the only solution is "shitheads." And although the whole tale may sound a wee bit dubious, this wouldn't be Countdown's first brush with naughty word scrambles. On more than one episode the word "wankers" was declared and last year players were asked to create a word using the letters "AUODFCKEG." Fortunately, neither of the contestants went for it. Koch Media, Nintendo and Channel 4, which broadcasts the original Countdown game show, all declined to comment on the situation. Source: The Sun, with thanks to Caliostro for the tip.